ZirTek™ ZLS restorations are fabricated out of a high-quality zirconia-reinforced lithium silicate that has a unique microstructure. This innovative formulation ensures high esthetics and strength. 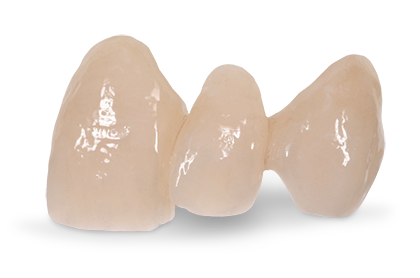 ZirTek™ ZLS offers the ideal balance of translucency and opalescence for a lifelike beauty that is comparable to IPS e.max®. It surpasses the strength of IPS e.max® and provides dependable durability with more than 500 MPa. ZirTek™ ZLS matches all 16 VITA® Classical Shades and produces an attractive chameleon effect for in-vivo blending. Along with the rest of our ZirTek™ line of restorations, ZirTek™ ZLS has a lab turnaround time of 5 days and comes with a 7-year warranty.